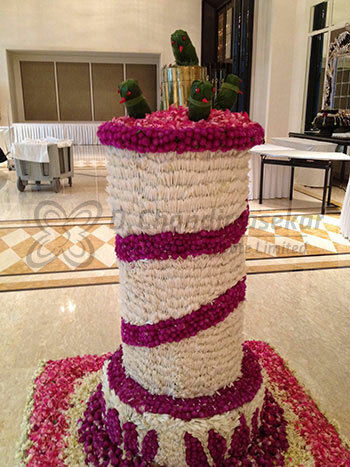 The natural beauty of flowers is further enhanced by artistically arranging them to suit the occasion. They play a significant role in creating the ambience for weddings, parties or any other occasions. From the traditional Chinese flower arrangements and the Japanese Ikebana, which use balancing and creating harmony between the flowers and their container as a meditative technique and help bring the outdoor in, to the modern arrangements of flowers in the shape of objects, there is no limit when it comes to this art and what it can do to brighten up any situation. Flower arrangements always give the visitor a sense of belonging, which is why many reception areas have fresh flowers. While a humble flower decoration on the kitchen table has its own charm, galas and larger gatherings use enormous festoons of flowers to decorate the area. Though roses are unarguably the most beloved of all flowers for their beauty, versatility and hardiness, there are others more traditional flowers like daisies, carnations and chrysanthemums and more unconventional flowers like tiger lilies, tropical flowers like jasmine and hibiscus and even acacia that can be used to make an arrangement stand out. Whether a part of wedding decorations or other more formal events, there is always more than one way to display flowers. The use of flowers is pretty straight forward for weddings. D.Chandirrasekar Decorations can help you chose a wedding stage decoration to suit your theme. Arches of flowers from the entrance, bridal bouquets and decorating religious venues are also great ways to incorporate a little green. For a party, floral centerpieces can be used to decorate the tables. This works especially well for large dinner parties like Christmas. For an even more sober occasion or as a gift, flower baskets can be used to decorate smaller spaces as they can be hung out of the way or other items can be added to it to make a gift basket. Another alternative to the floral gift basket is a flower bouquet made from the receiver’s favourite flowers. Take a look at our gallery and prepare to be surprised by the breathtaking designs we have make for our past clients. We undertake everything from traditional flower arrangements for offices to more modern asymmetrical arrangements of rare flowers for a house warming party, from wedding aisle decoration with flower petals to garnish pillars of fresh flowers to mark the entrance to a wedding reception. Whatever the occasion is, D.Chandirrasekar Decorations hopes to make your event a little greener with the most stunning flower arrangements in Chennai.